To make the meatballs, heat the oil in the frying pan and gently fry the onion for a few minutes to soften. Add the garlic to the pan and cook for a minute to brown. Put the cooked onion in a bowl with all the other meatball ingredients and mix together with your hands until well combined. Shape the mixture into table tennis size balls (I got about 16 meatballs), set on a plate and then chill for 20-30 minutes to firm up. Toss the onion, courgette and pepper with the olive oil and roast for 30 minutes – stirring half way through. 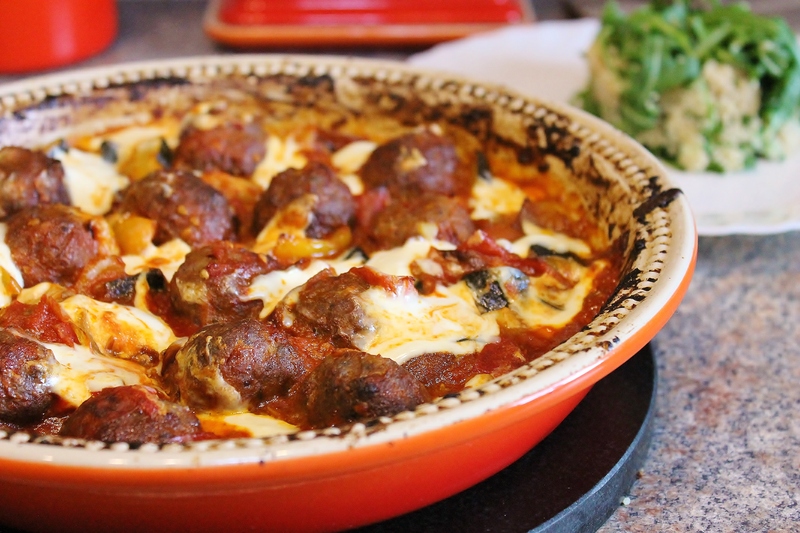 Stir in the tomatoes and lay the meatballs on top, return the dish to the oven for 20 minutes. Give the mixture another stir and the return to the oven for a further 10 minutes. Finally, remove the dish from the oven, stir in the ketchup until everything is well combined and then dob the mascarpone all over the top. Return the pan to the oven and bake for 10 minutes. Remove from the oven and serve with the couscous and salad. Yum, this looks wonderful! I’ll give this a try soon, I think the husband would love it! Thank you! Wow this looks fantastic- very comforting! 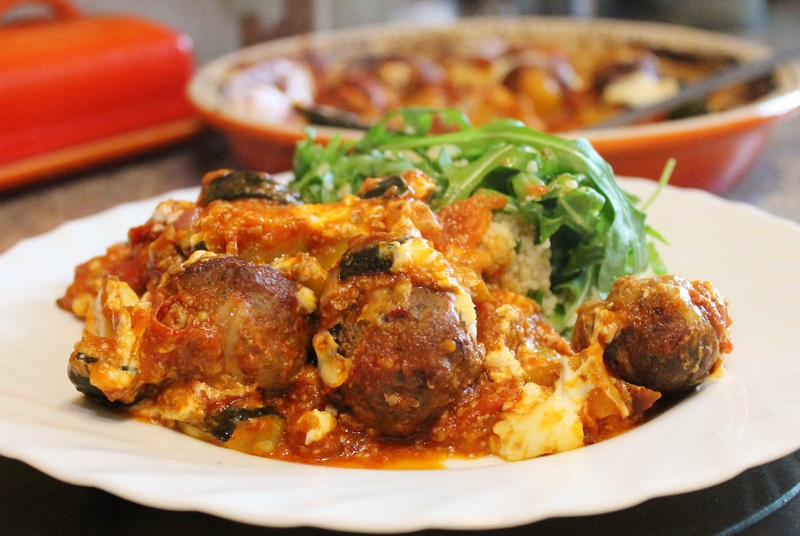 Meatballs are one of my favourite comfort foods 🙂 Loving the sundried tomato idea, never tried that before! Thanks for some inspiration! This sounds amazing and fresh! I can’t wait to try it out. Thanks for posting! I had a terrible mishap and learning experience with some saffron on kabobs that has put me off for a while, BUT the meatballs look incredible. My wife is all about the roasted or sun dried tomatoes. When you say tomatoes in the ingredients are you referring to sun-dried tomatoes or just regular tomatoes? This recipe looks delicious, but I don’t see any sun-dried tomatoes – am i missing something? Whooops! My mistake – I missed them off the list. Thank you for pointed them out – I have now added them to the list of ingredients. 😉 You are not alone! I have done this myself at times! Mouth is watering just from the pic! This sounds delicious. Thanks for sharing. Thanks also for stopping by my blog. Can I eat this right now?! Look so yum! !